I'm still settling into the new office in Elgin. 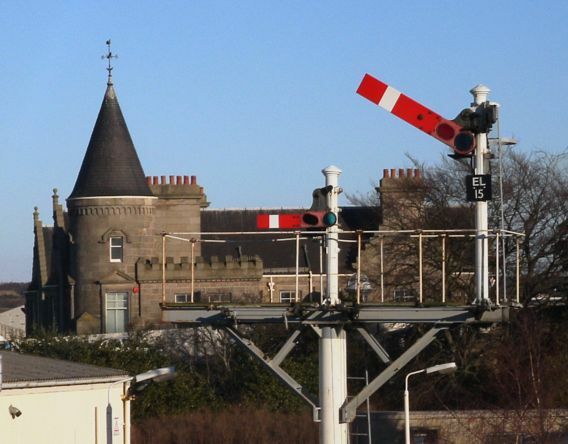 We're located in the old train station (the large stone building behind the semaphore signals in the picture). Every hour or so the building shakes slightly as a train rolls through on the Aberdeen/Inverness main line. A most refreshing change from listening to the notorious Inverness seagulls all day. Not that we're lacking for things in the air; RAF Lossiemouth is located just a few kilometers north. All manner of weird and wonderful things come screaming by overhead as a result. Unfortunately I haven't been able to see much of the town yet. As soon as work is a little less hectic, I'll go out and do some exploring. Here's a map.